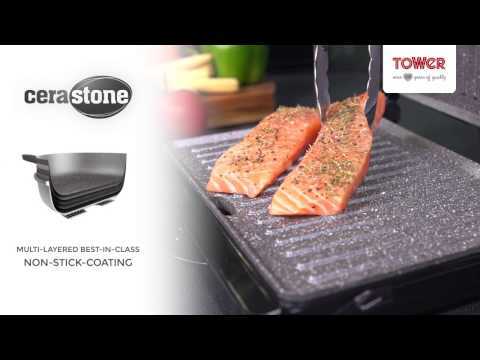 Make healthy eating hassle-free with the Tower Ceramic Health Grill and Griddle. Stylish and functional, this appliance will make a great addition to any kitchen. The Health Grill features innovative Cerastone coated non-stick plates for virtually oil free cooking and the hinged top plate design automatically adjusts meaning that the grill can handle thick steaks, chicken breasts and fish fillets with ease. An integrated grease release ledge and removable drip tray filter away excess oil and grease, collecting it in the drip dray for easy disposal. The grill is perfect for creating healthier meals for the family and the 1000W of power ensures an evenly cooked result every time. Excellent non stick, easy clean. Love this grill, it is so versatile, so far have cooked steak, chicken, bacon and sausages perfectly. It also makes great toasted sandwiches can cook two sandwiches at a time. Nothing sticks so it is very easy to clean. Love this! Fab for lots of lovely vegan meals, snacks and paninis. The best kitchen item I have bought. This is a great product. I only wished i had bought one sooner instead of making do with a george forman grill. Much better for my families needs. previously had small george foreman but love my new tower grill,much cleaner and cooks more efficiently .really pleased with it. This health grill is versatile but particularly good at paninis because of the hinged lid. The non-stick plates are high quality and I would imagine they would last a long time. The design is compact but very sturdy and compares favourably to similar items in price and quality. Bought this product to replace an old sandwich maker, which was sticking and also\nmade the sandwich too small\nHave been pleased as it can do any size sandwich now and the non stick coating is\nvery good. Very easy to use, good quality, cooks great, and easy to clean. I wanted this grill / griddle to use in our holiday home in preference to using a full size cooker all of the time. With the hinged lid it can accommodate a variety of foods and cooks very well. I would recommend this product as it is good value for money, well built and easy to clean. The ceramic health grill and griddle is great value and being able to grill for four is fantastic for a busy family on the go on weekdays. At the weekends the griddle comes into its own cooking juicey stakes with a healthy option for all the family . What a great product. Smaller than expected but far from disappointed. Still large enough to cook 2 paninis and they cook quickly thanks to the 1000w. Quick to heat up from cold.\nVery happy with the purchase and extremely good value for money. What a great product. Smaller than expected but far from disappointed. Still large enough to cook 2 paninis and they cook quickly thanks to the 1000w. Quick to heat up from cold. Very happy with the purchase and extremely good value for money.